Trade dress cases are fun. Trade dress typically refers to the visual appearance of something – such as a product’s packaging or the design of the product. The shape of a Coca-Cola bottle is an example of trade dress. When you see that distinctive bottle shape, you immediately think of the source, Coca-Cola. hoops; large-bulb Christmas lights; wall-mounted sports memorabilia; bumper stickers; and “beachy” music from the ‘50s through the ‘80s. However, the court in that case focused on the very first item in that list – the Hooters Girl uniform. Ultimately, the court found that the Hooters uniform is “functional,” and to deny another business from being able to use waitresses in shorty-shorts and tank tops would be an “impermissible burden on competition.” Thus, you now have two places to go get wings and see girls in tiny outfits. You just need to choose if you prefer orange/white uniforms or black/red. This case got my attention because of the “Yoga Berry” plaintiff. My first thought was that famed catcher Yogi Berra must have gotten into the health nut business or something. But no, there does not seem to be a relationship between Yogi Berra and Yoga Berry (although I cannot confirm or deny it). That makes this a somewhat unsympathetic plaintiff for me. Before even reading the complaint I was thinking, “Gee, if these guys are trading on the name of the great Yogi Berra, what beef do they have with Coco Mango? 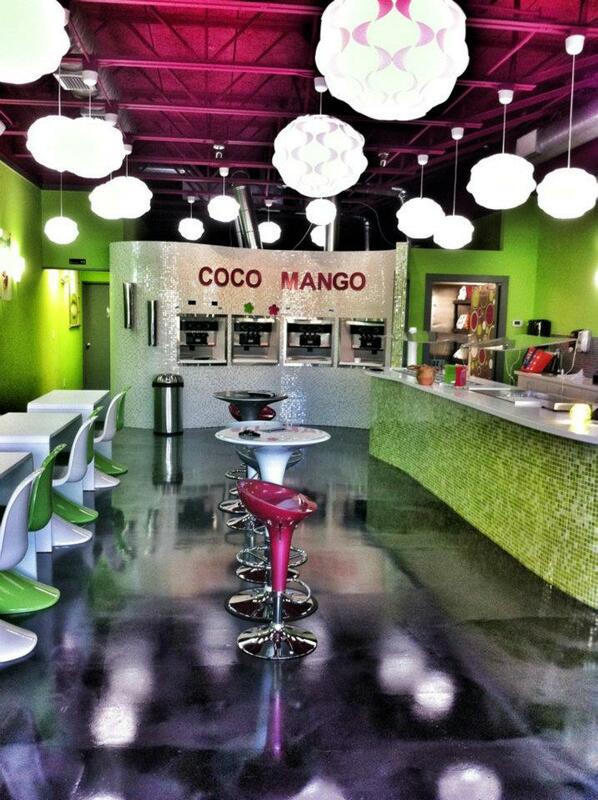 Yoga Berry is suing the operator of a “Coco Mango” yogurt store. Yoga Berry alleges that Coco Mango copied the distinctive trade dress found in the YOBE yogurt stores. Yoga Berry has a tough hill to climb. Just as Hooters learned that even a distinctive and well-recognized decor can ultimately fail as trade dress, Yoga Berry will have to prove that its trade dress is protectable. The Complaint could be a little clearer in defining the trade dress, but it looks like a YOBE store has “futuristic white stools, chairs, table, and benches,” and “distinctive light fixtures” among other things. Pictures or exhibits would have been nice in a complaint like this. (I’m sure the judge would have appreciated them, too.) However, since there were none, I took the opportunity to find some. Having never been in either store, I just couldn’t picture what the Complaint was trying to show. Ok, so maybe the local Scan Design or IKEA was having a sale. You have to admit – the light fixtures and stools look to be identical, if not different colors. But, is this really protectable trade dress? When consumers see those light fixtures, stools, and other items that are claimed as trade dress, do those consumers think of the source, Yoga Berry? Or is this more like the Hooters/Winghouse case where no one business should be able to lock up the “uncomfortable modern chairs and lamps” decoration? Assuming that the allegations in the Complaint are true, the operator of Coco Mango decided not to open a “YOBE” franchise as offered by Yoga Berry. 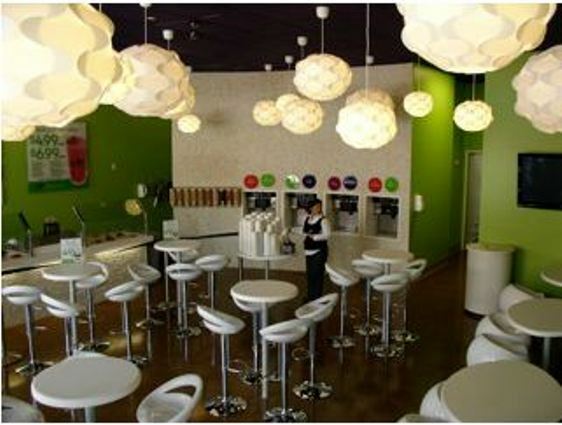 But, instead of simply opening a different yogurt shop with traditionally-boring yogurt shop fixtures, the Coco Mango operator decided to simply source the same lamps, chairs, and other fixtures that Yoga Berry counts as its own trade dress. Why pay the franchise fee when you can simply duplicate the look and feel that the franchisor is selling? And how did Yoga Berry discover this smoking gun information? A Yoga Berry “representative” went to Coco Mango to ask about it, and the employee disclosed the reason for the chairs, lamps, and other decor. Oops. Coco Mango has answered the complaint (in distinctive Arial font, not Times New Roman as Yoga Berry’s complaint) so we should have some more to write about in the future. My money is on one of the unfair competition counts. The trade dress and state dilution claims seem like a stretch. But, it ain’t over til it’s over.